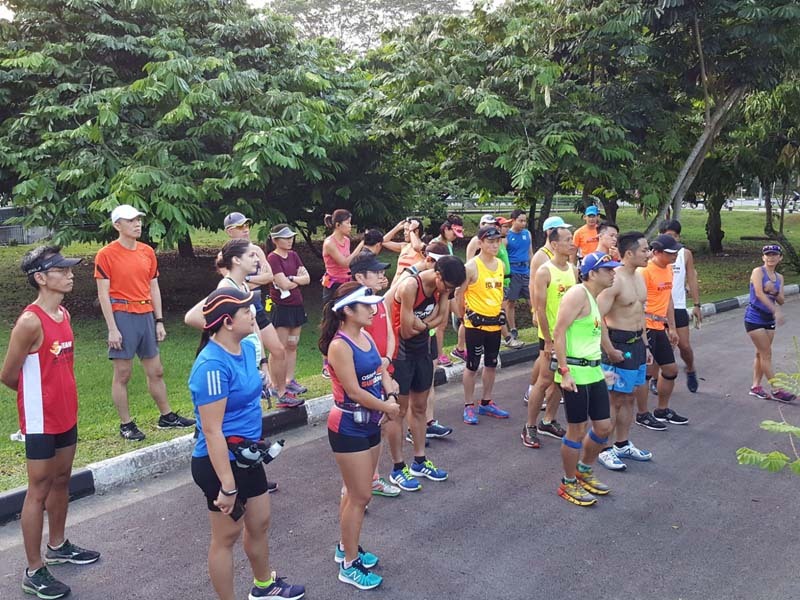 With 11 weeks to Standard Chartered Singapore Marathon (SCSM17), the Sunbirds continued their aerobic base and fuel efficiency development at the challenging trails and slopes of MacRitchie Reservoir Park. The training tip of the week was training variation and in the correct heart rate zones and intensity (FlightZONES). 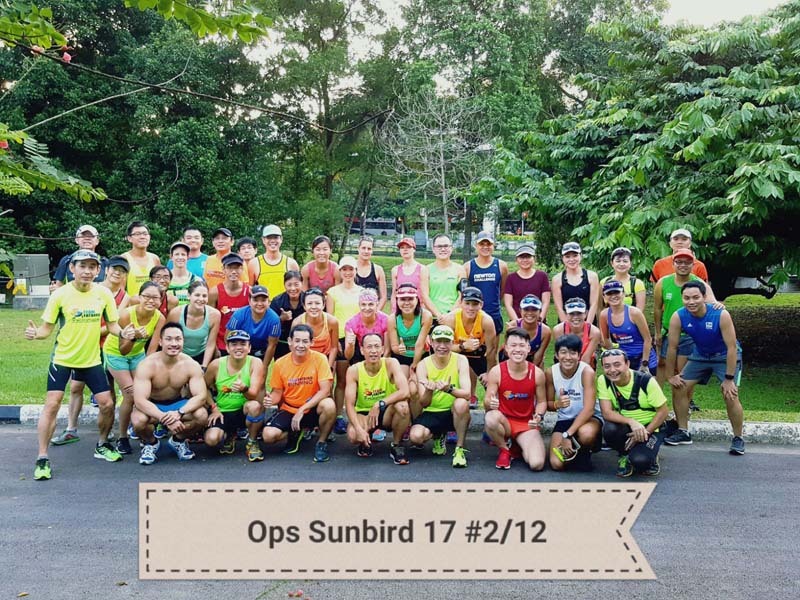 The Sunbird trainees absorbed all the new information with enthusiasm, before breaking up into their respective training groups for the long run requirement at BaseBuild Pace. The first stretch along the Northern and Venus Trails provided a jolting warm up for some of the runners starting out too fast. 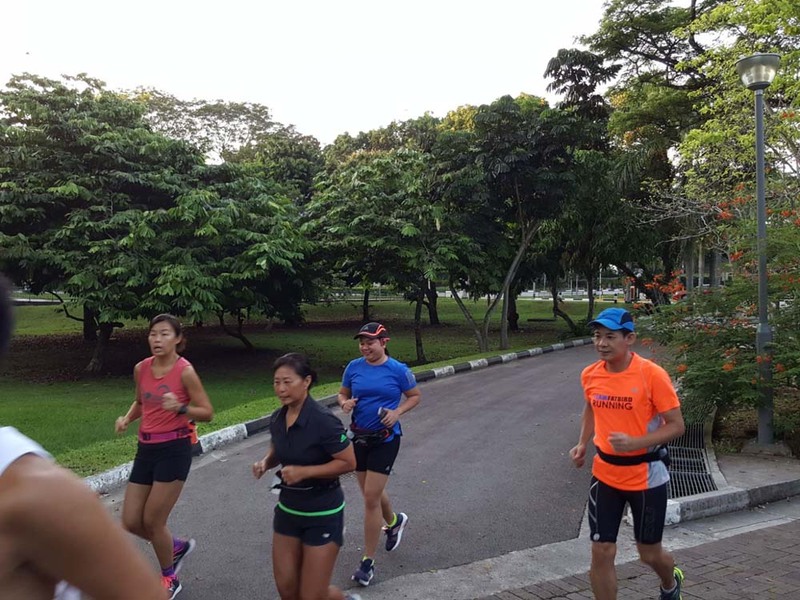 5km into the run, most have settled into a comfortable and sustainable pace to effectively get the training effects. 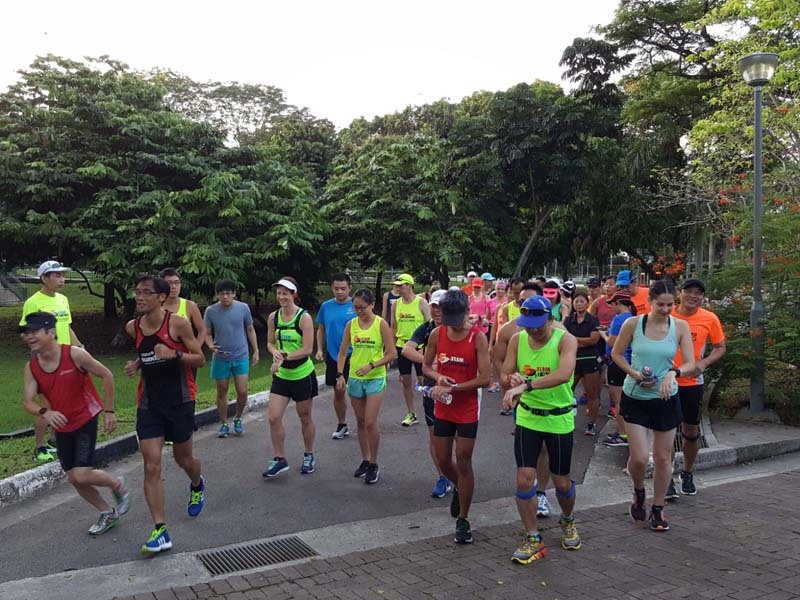 The road stretch along Upper Thomson Road, Peirce Rservoir Road gave the legs some relief coming out from the trails. 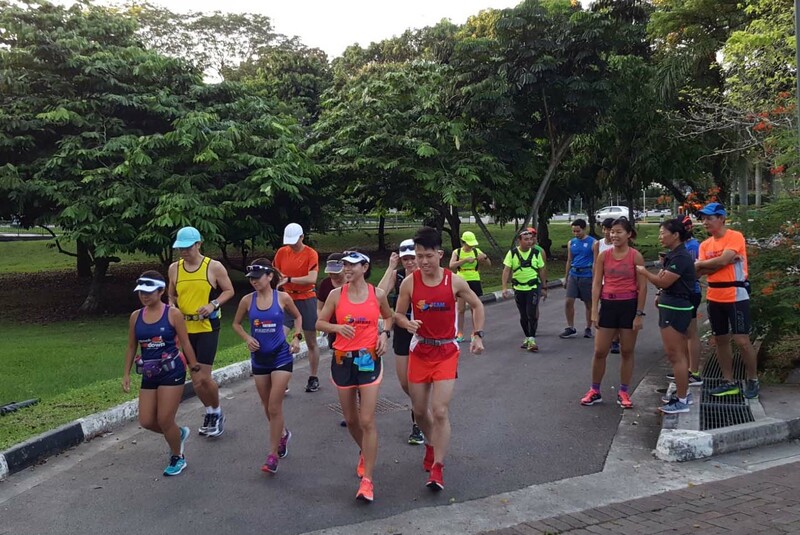 The Half Marathon trainees who were supposed to do 13km, made a U-turn with their respective group trainers at the UPR toilet. The Full Marathoners proceeded on into the rolling slopes of Lower Perice Reservoir Rd for more leg strength conditioning and and depletion of their glycogen stores. 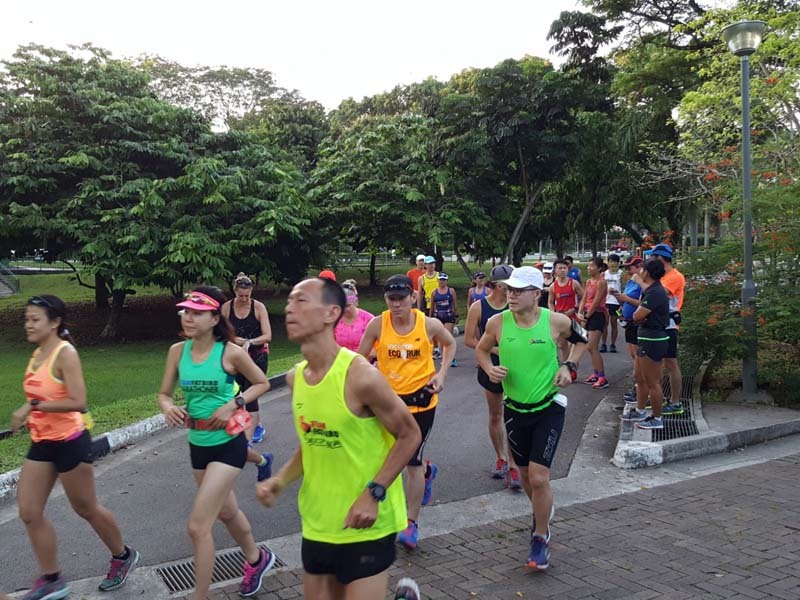 Their 22km run will have them enter the ‘aircond’ road and U-turn at the LPR toilet to tackle the rolling slopes on the opposite direction. The return back onto Venus Trail provided additional challenges because of the thickening crowd of walkers and tourists, breaking our momentum. We have to stop and go many times over the short stretch, but that took a lot more effort on our tiring legs and emptying glycogen stores. 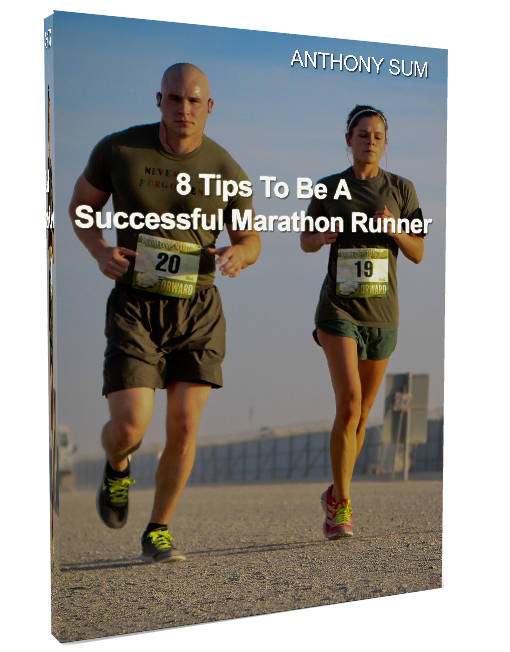 With 90 min of running done, most of us would be hoping to get the body to start utilizing fat. The Northern Trail of slopes seemed endless on the return. Its ups and downs sucked more resources from the tiring Sunbirds, providing even more challenge for the trainees to maintain good form and sustain training pace. The saving grace was the thick cover in the MR trails providing shelter from the heat of the sun, lessening the ‘mental’ pain of finishing the final 4km of the long run. Still, the Sunbirds did very well to complete their training requirements by 10am. They were rewarded with isotonic drinks and bananas for fuel replenishment into their empty ‘tanks’. A debrief on the training run was given, with pre run (breakfast) and post run (recovery) nutrition and how they impact on our training development and adaptation. The trainees also spent some time to speak with their respective trainers on how they train during the weekdays, and what they can do better to prepare for the next few weeks of training. The Sunbirds Beat The MR Trails & Slopes!